The Stockholm University Press team has in the past year seen the result of the hard work of authors and editors, which meant that we could publish nine books in three languages, with topics spanning from the performing arts to the art of teaching. We now have a total of 22 books published, and this years’ production is 41% of the total number of titles. Small university press like ours could, and perhaps should, not compete with the big multinational publishing companies regarding pure numbers and profit. Nevertheless, an analysis of the year in numbers could still be helpful for us when we take a look at what we have accomplished so far. In the past year, the team managed 22 book proposals, of which seven has been declined, six has been accepted, and nine proposals are still pending review. We managed to sign 7 new book contracts, of which most will be published in 2019. The past year has been our most productive regarding the number of published books as we managed to release nine new titles. Although, don’t think that the number of titles is necessarily the only measure of success. Sometimes a project needs to take some time to finalize, as we would not like to push out anything of low quality. The most significant accomplishment for us would still be that authors that are happy with the result and that we can see the readership growing. However, most of the work with new books is going on behind the scenes, and we get many questions about the review process for books and why it is taking so long. Part of the challenge is to find good reviewers that have time to comment on proposals and manuscripts in an orderly fashion. This means that we have to send a lot of invitations before we find a perfect candidate. During 2018 we have sent 55 letters of invitation to review book proposals and another 35 letters to reviewers asking for comments about full manuscripts. As all the letters sent can be counted in time, which is a scarce resource both for the academics we work with and the press team, we have been looking at possibilities to shortening handling times from submission of book proposals to the date of publication. Therefore, the Publishing Committee decided, based on advice from the editorial boards, at their last meeting of the year that we should not require an anonymous peer-review process for proposals in the future. The book proposals will from now on be reviewed by an Editorial Board (see instructions for how to start such a group). We will, however, keep the rigorous (and often single-blinded) peer-review process for full manuscripts. While we managed to publish many books this year, it is even more interesting to find out what happened with our content after the publication date. We can, for example, look at the number of downloads and views of the books published in the past four years since we started this endeavour. 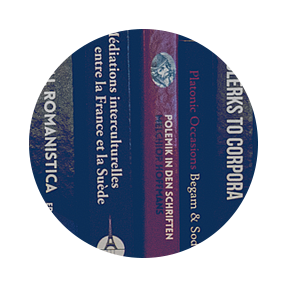 The most downloaded book so far is Festival Romanistica – Contribuciones linguísticas – Contributions linguistiques – Contributi linguistici – Contribuições linguísticas. This edited collection has been downloaded a total of 9,710 (or, an average of 232 downloads per month since the publication date), including chapters as well as the full book. The most frequently downloaded book per month relative to the time it has been available is Essays in Anarchism and Religion Vol II. This title has been downloaded and viewed only 708 times so far, but if you look at the frequency of downloads per month published it is in the lead with 331. It should be noted that anthologies naturally attract more downloads, as authors promote and link to their work in for example university repositories. Downloads are of course an essential measure for online publishing, but it is hard to know what readers did once the downloaded the book. Did they really read it, or even enjoy it? For academic books, we also want to know whether or not the content contributed something to any further works by researchers. Citation counting is a debated tool and citations are often used as a measure that could say something about influence in a research field with varying accuracy. The most cited book of ours so far is Médiations interculturelles entre la France et la Suède Trajectoires et circulations de 1945 à nos jours, which has noted 16 citations in Web of Science. This book has been downloaded or viewed 5,157 times. Seven of the books in our catalogue show citation statistics in Web of Science, but we can find more citations in open services like Dimensions, so one database might not catch them all. Attention for published books can also be measured with altmetrics, a way to capture how content has been mentioned or referred to in different social media and other online sources. The highest altmetric score among our books has been gathered by Essays in Anarchism and Religion Volume 1, with a score of 22 according to the database altmetric.com. If we take a look at what the score means, it reveals that the most mentions of the book come from about 20 users who chose to share a link to the book with their followers. The editors and authors of this series of books about anarchism and religion seem to be active in social media, as volume 2 by the same are number two on the list of highest altmetric scores. The numbers above all relate to the online version of our books, which is our main output. However, we do also provide service to readers who still prefer the print format, and all titles in our list are therefore available to order as print-on-demand from a number of well-renowned distributors and booksellers. In 2018, there were 164 print books ordered from different parts of the world, which is an increase from previous years (naturally, as we have released more titles). The total number of print orders across the four years we have been running this operation is 421. The most ordered titles in 2018 were De estetiska ämnenas didaktik – Utmaningar, processer och protester and Essays in Anarchism and Religion Volume I, with 23 orders each. The most common channels for distribution of books are Ingram Book Company, which provides bookstores all over the world, and the Swedish bookseller Adlibris. The print distribution stands for about 2% of the readership of our books. Stockholm University Press does not collect profit from the sales of these books. Then on the journals side, we saw the first volume being published by Revue nordique des études francophones/Nordic Journal of Francophone Studies, which seems to be picking up in usage. We also completed the first volume of Scandinavian Journal of Disability Research on our platform, according to the budget and on time. The seven journals on our list published 78 articles this year, which adds to the 934 they already had in the archives. These journal articles were downloaded 34,617 times and viewed 101,577 times (note that the full text of all articles on our platforms is available directly when viewing an article page). We saw an increase in general with regards to website traffic, and many Editors contributed to that by exploring opportunities to market their journals via social media channels. Link referrals from social media sites are the second most common manner for users to find their way to our journal sites, besides Google and Google Scholar. All in all, it has been a great year, stemming from some hard days’ work, but it has all been worth it, as we have managed to put out more good research publications than ever. With this, we would like to send the warmest wishes of a Happy Holiday and a Joyful New Year to all the authors, editors and reviewers who made the most important contribution to make our year a great one. We would also like to extend the seasons’ greetings to all our collaborators, colleagues and friends in the library and scholar-led publishing community. We could not have done this without you! Let’s look forward to another prosperous new year together.